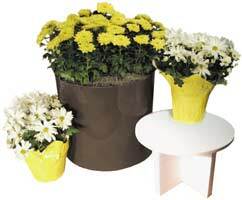 Grouping of blooming plants in a decorative container is a great add-on sale or additional rental. Mums, azaleas and poinsettias are great impulse sales. Move them out the door quickly and in a professional manner with the Bloomer Table. Just drop the Bloomer Table top and base along with Wedgits into a deco and it is instantly staged for bloomers and their liners! No messy peanuts, cardboard, or time consuming cut up sheet styro. How does the Bloomer Table and Wedgits work?